Sharing borders with China, Tibet, Bhutan and Myanmar, Arunachal Pradesh has a remarkably low population. Arunachal Pradesh became the 24th state of Indian Union on February 20, 1987. The state’s main claims to fame for the tourist are snow capped high peaks, Buddhist monasteries, verdant forests, winding streams and exotic wildlife. 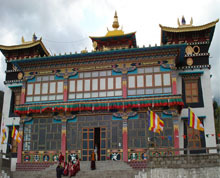 Buddhist monasteries (Tawang Monastery) and archeological sites (Malinithan and Itanagar) dating back centuries are more than just a ruin for traveler to get their photo taken in front of: they are as relevant in daily life as ever. Arunachal Pradesh holds a large and varied flora and fauna populations. The state is home to orchids, known for their exquisitely beautiful blooms.